Overall: The Amana ABL2222FES Bottom Freezer Refrigerator is one of the Top Rated Amana Refrigerators. With 22.1 cu. ft. of storage space, extremely quiet running and the durability of the Amana brand, you can understand why. 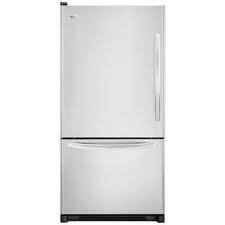 This fridge was one of the Top Performers in the Amana line and remains quite popular with many consumers. It's got a bit higher MSRP for this type of fridge ($1,800.00) but we've managed to find it as low as $1,200.00. If you opt to not have it in stainless steel, you can find it for about $1,000.00. Capacity: 22.1 cubic feet - honestly that's a great deal of storage. First off, the door with Reversible Swing was fantastic. Put it in any kitchen and it works fine for any layout. We loved the touch controls to provide the fridge with more accurate temperature maintainability. No more guessing at it with the numbers on your old dial. The Temperature-controlled Chef’s Pantry™ drawer was really great for deli items like cold cuts and cheese. One thing we really wished was different was the lack of an ice maker on this unit which we felt you might miss. MSRP: $1,839.00 was what it was suggest to sell for but it has since been discontinued. The good news is that we have more bottom freezer refrigerator reviews that should be able to help you in your search, just scroll down and click to see them.